A new survey of mobile app developers shows that Apple iOS is where the money is, despite Android's higher market share among mobile devices. VisionMobile surveyed more than 8,000 developers across 143 countries, and the ensuing report presents a detailed snapshot of the state of the mobile app economy. The consistent theme is that Apple's iOS platform is the place to be if your aim is cold, hard cash rather than obtaining maximum reach for your app. Of those developers that target Android as their primary platform, 20 per cent achieve zero monthly revenue, compared with only 12 per cent of those targeting iOS. At the other end of the scale, eight per cent of the iOS folk raise over $200,000 in revenue per month, compared with only three per cent of those targeting Android. It turns out, in fact, that the second most profitable platform after iOS is not Android, but the mobile browser. Another tip for developers in search of fortune is to code enterprise apps. Some 43 per cent of enterprise app developers make $10,000 per month, versus only 19 per cent of consumer app developers. "It's very hard to convince consumers to part with their cash for software and digital services," observe the report's authors, Mark Wilcox and Christina Voskoglou. And what about running ads in your app? According to this survey, that's a big fail. "There's a phenomenal amount of user attention lavished upon those tiny little smartphone screens and a lot of developers trying to monetise it with ads. This produces almost unlimited inventory for advertisers to buy and, as a result, each ad impression is worth very little indeed," the authors write. Wilcox and Voskoglou do not expect the division between Android and iOS to change soon, either, describing the situation as a stalemate. "The iOS ecosystem appears to have a lock on the high end that will be hard to break," they write, while for Android smartphone vendors, "inability for manufacturers to differentiate significantly from one another prevents them from competing in the premium market". At the same time, "Apple cannot move down-market," they claim, "without cannibalising its high-end sales". There are big regional differences, as you would expect. 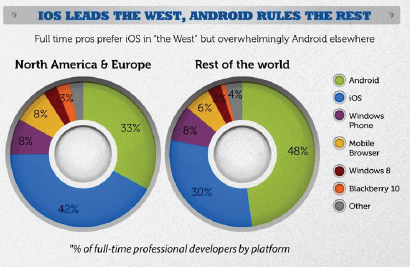 In North America and Europe, iOS has 42 per cent of full-time app developers, compared with 33 per cent for Android. In the rest of the world, Android has 48 per cent, versus 30 per cent for iOS. The report pegs the number of developers who primarily target Android at 40 per cent, iOS at 37 per cent, and Windows Phone comes in third at just 8 per cent. Of course, many developers also target other platforms. If you take into account all supported platforms, the figures rise to 71 per cent Android, 54 per cent iOS, and 30 per cent Windows Phone. While that seems somewhat hopeful for Microsoft's platform, the writers note that "top new apps come to the Windows Phone platform quite slowly, if at all, and many others are not updated". They also find that Windows Phone has a disproportionate share of hobbyists and experimenters who try out mobile development using Microsoft's excellent tools, but turn to Android and iOS for reach when they get serious.